This book is too cute. I bought it last year when I was teaching 3K as a way to introduce glue skills. 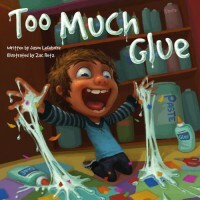 Its about a boy who uses to much glue and everything gets stuck to him. We read the book and made ourselves into "Too Much Glue People" glueing scraps to a template of a body that I had put the kids pictures on. The only thing about this book is that it's a little long so my preschoolers got a little bored but for K-2 I think it would be ok and it would be great at the beginning of the year to show that "a dot is a lot with glue"